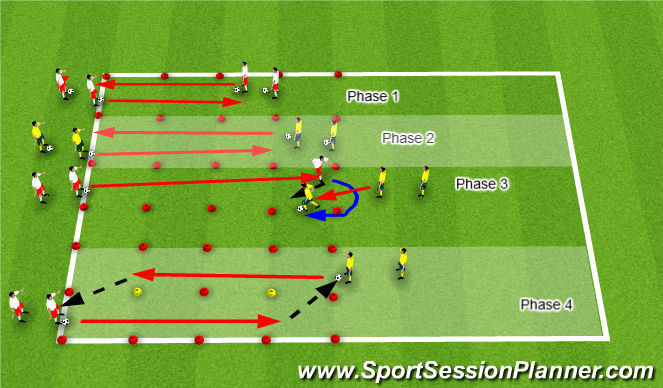 Phase 1 - Players 10 yards apart dribble across to partner( close control lots of touches). pullback now turns and puts a little pressure on player going back the other way. they play a pass across through the yellow cone to the next player. 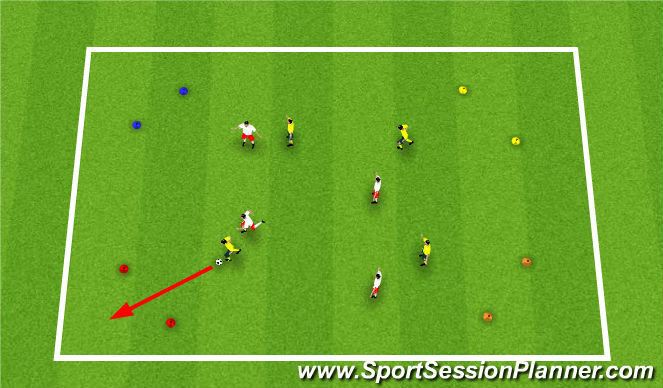 1.Group A starts with player dribbling through the cones. As the player comes out of the last cone they shoot on goal, and immediately become goalkeeper. 2.As Player A takes a shot, first player in group B becomes active and dribbles through the cones and tries to score on Player A before he get in the net. 3.Each players is a goalkeeper after their shot, when they face the shot, they dribble the ball back to their group. -2 minute games or first team to score stays on. -This four goal game you get a point for dribbling the ball through the goals. You can’t score on the same goal must attack one of the other 3 goals.